Suggestions, what is it for and how does it work? 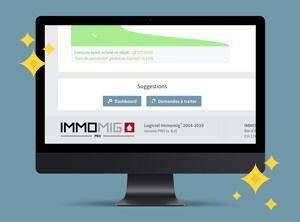 Version 8.0 of Immomig® has the advantage of offering you many new features compared to the previous version. One of them is the suggestions. They have been introduced to help you improve your efficiency and also to facilitate your use of the software. These suggestions are located at the bottom left of each page of the software and provide you with two direct links to other pages related to the page you are on. Therefore, these proposals are contextual and targeted and vary from page to page. It's very simple. If the suggestion is the right one, just one click is enough for you and you are already on the page you wanted without even having to go back to the main navigation! Test it yourself, it's fantastic!